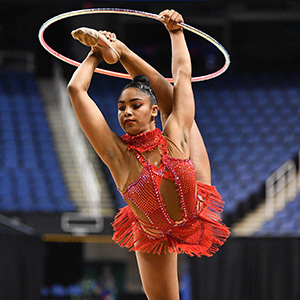 KIEV, Ukraine, March 17, 2019 -- Nastasya Generalova of Los Angeles/California Rhythms, finished in fifth place in the hoop final at the Grand Prix in Kiev, Ukraine. Generalova posted an 18.150 for fifth in the hoop final. Ukraine’s Vlada Nikolchenko won hoop crown at 20.900. Russia’s Ekaterina Selezneva posted a 20.750 for second, and Bulgaria’s Katrin Taseva was third with a 19.850. The other three event champions were: ball, Selezneva (21.050); clubs, Georgia's Salome Pazhava (19.700); and ribbon, Taseva (18.250).